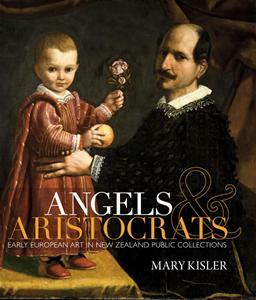 Mary Kisler, Angels & Aristocrats Early European Art in New Zealand Public Collections, (Random House, 2010), 399 pp., $74.99. Angels & Aristocrats is a landmark, a useful reference, and one can simply enjoy its fine illustrations – though it has limitations and flaws. There has been very little published about the old European art in New Zealand public collections, so it was good to hear of Mary Kisler’s project when it was in preparation. Peter Tomory and Robert Gaston’s Summary Catalogue European Paintings Before 1800 in Australian and New Zealand Public Collections, which came out in 1989, is the only other book-length study to cover the ground, or much of it, because unlike Kisler, the authors restricted themselves to paintings. Moreover, within its narrower compass, Tomory and Gaston’s review was not comprehensive. For example it didn’t include the Dunedin Public Art Gallery’s Madonna and Child by Zanobi Machiavelli (1418–79), a fairly glaring omission considering the significance of the work. And Tomory and Gaston scarcely discuss questions of attribution or identity, which are numerous in this field and often contentious. By contrast, Ms Kisler does venture into those matters, so her scope is potentially more useful. There are a few other sources people can use to background Ms Kisler’s efforts. There is my Treasures of the Dunedin Public Art Gallery, which came out in 1990, and Beloved: Works from the Dunedin Public Art Gallery, with thirty contributors, which was published in 2009. Each of these covers some of the DPAG’s European old master works, and from them it is possible to see that some attributions have changed, as well as the identifications of some subjects. Similarly, there is the Auckland Art Gallery’s summary catalogue of its holdings, which included a number of its European old masters. For the purposes of her study, Ms Kisler looked at the collections of the public galleries in Auckland, Whanganui, Christchurch and Dunedin, and at the collection held in the national museum, Te Papa in Wellington. Such a survey covers the great majority of European old master paintings in public ownership in New Zealand, as well as the many prints and other works on paper, and the rather scant holdings we have of related sculpture. Some things have escaped her net, such as the Flemish statuette and the Della Robbia Madonna in the Otago Museum. But the demands of making a study like Ms Kisler’s are considerable, and searching around institutions not wholly or overtly devoted to art may have seemed too laborious for the likely returns. One significant resource of publicly owned old European art she has not reviewed is this country’s holdings of illuminated medieval manuscripts, concentrated in a few public libraries — mostly in Auckland and Dunedin. This too may be forgiven because it was covered well, at least descriptively, in a catalogue published by Vera Vines, Margaret Mannion and Chris de Hamel in 1989. More regrettably, she hasn’t attempted to review the Classical holdings, mostly figured ceramics, in the Fels and Logie collections of the Otago and Canterbury museums, the latter sadly damaged in the September earthquake last year. We also need to keep in mind that Ms Kisler’s book is not really so widely encompassing as its subtitle suggests. Perhaps its ‘early’ is the New Zealand vernacular for ‘old’? However that may be, her horizon is actually late. European art has been around since at least the days of Mycenae and Knossos, which were flourishing in the thirteenth and fifteenth centuries BC, respectively, both represented in the Otago Museum’s Fels collection. The oldest work Ms Kisler reviews is from the twelfth century AD. Angels and Aristocrats is not aimed solely at an academic audience. It is intended for the general reader, and Ms Kisler means to locate New Zealand-owned works in the larger context of their time and place of making, which she does very well. What does give cause for concern is the number of mistakes, some minor, others less so. I’ve mentioned these before when I discussed the book in my column in the Otago Daily Times. It would be unkind to needlessly list them all again. A few will do as examples. On page 26, William Mathew Hodgkins is said to have died in 1895, while his death actually occurred in 1898. At page 27, Ms Kisler says the Dunedin Public Art Gallery moved to its building in the Octagon in 1990, whereas that happened in 1996. She has also, at page 26, misidentified the Lady McLean who successfully raised funds for a new building for the Dunedin gallery in 1907 with the wife of the Honourable John McLean, and, with a certain disregard for actual geography, has her living ‘in Lumsden near Oamaru’. I take it Ms Kisler is referring to services Dr de Beer performed on the gallery’s behalf. He did know London dealers and museum people, and sometimes acted as the gallery’s ears and eyes, for instance in the case of the Salvator Rosa Rocky Landscape which Ms Kisler discusses, although she doesn’t mention the role he played in its acquisition. This was in addition to buying works with his and his sisters’ money, and presenting them to the gallery in all of their names. Ms Kisler notes such acts of generosity, but appears to have overlooked Dr de Beer’s considerable connoisseurship which was of significant value to the gallery. Her treatment of some attributions and identifications is also a matter of concern. In Beloved I attributed the Dunedin gallery’s Birth of the Saviour to the studio of Bartholomaus Bruyn, following an overseas authority. At page 77 Ms Kisler gives it to the artist himself, a not inconsiderable change. She may have her reasons, but she doesn’t give any. Indeed she doesn’t even note there has been a change. Similarly, at page 356, the Dunedin painting of Saint John, which was formerly attributed to Bartolomeo Schedoni, she gives to the circle of Francesco Cozza without mentioning this is a change. Again, while Beloved changed the identification of the sitter in Dunedin’s portrait by Cornelius Johnson, which Ms Kisler followed at her page 267, neither Beloved nor Angels and Aristocrats mentions the argument, present in the gallery’s records, for supposing the sitter is King Charles I’s Queen, Henrietta Maria. Historians generally, and art historians more particularly, are not always very good at giving the reasons for their judgements, even when these are markedly different from earlier ones. They are sometimes careless about mentioning opposing views at all, let alone bothering to tell us why they differ. A recent case was Martin Kemp’s book making a case for a new proposed Leonardo. The trouble is this is not infrequently the case, I have found, in things written by distinguished art historians and which are taken as serious scholarly texts. I certainly wouldn’t describe Angels & Aristocrats as advocacy. There is no sign Ms Kisler has any axes to grind. But she has not been as careful as good scholarship really demands to point to changes and opposing views. Despite the flaws the book has much to recommend it. Ms Kisler is not trying to establish an order of merit. This permits hers to talk about works of minor, or even negligible, aesthetic distinction in order to illuminate the things their artists were trying to achieve – the conventions, artistic as well as social, which lay behind their making. She uses the works to illustrate not only European art history but, to some extent, European cultural history from the late middle ages to the nineteenth century. She is well-informed. Her prose is clear and her text has some nice, light touches. The numerous colour plates are a very useful record, and the book puts together information and images you can’t find anywhere else in a single volume. At present it represents the broadest cover we have of its subject. It would be good to have a supplementary volume covering our older European material. Perhaps one day we will. PETER ENTWISLE is a Dunedin-based writer, art historian and curator. He writes a regular column about the arts for the Otago Daily Times.